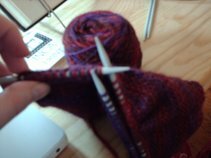 Grad School Knitter: a hat for.... me?! urchin for me!, originally uploaded by gradschoolknitter. I know, the hats. It's ridonk. But this one only took an afternoon (yesterday's to be precise) and it's so warm and awesome! The pattern is Urchin, this being the 3rd Urchin I have made... one about a year ago and the other for my cousin for Christmas... I still need to make another (also for me!) out of the Baby Alpaca Chunky 'cause it's so soft and wonderful. This one is made of Berroco Peruvia Quick. I lurve this colour for me, although it is a bit itchier than the one I made in Alpaca... but I'll survive. I am really liking this hat. I saw a picture of the first one you knit last week and loved it. 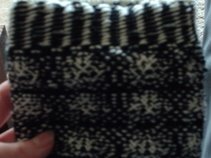 I have printed the pattern and have my wool ready to cast on as soon as I have my sweater blocked which will hopefully to tonight. When I saw this hat again it confirmed that I want to knit one for me! Beautiful! I used to hate hats but now I wear them a lot just to knit all the types out there. thanks! I love hats but never thought I looked good in them til I started making my own. I guess knitted hats just make everything better! Sign ups for swap #12 are currently open. Come check us out by clicking on the picture! Please note that all pictures, patterns, writings, comments, etc. found herewithin are property of the designer/knitter and owner of this blog. All of my patterns are also easy to find on ravelry and anyone posing as the designer of said patterns or knitted items will be found out and approached through the appropriate channels. Anyone may, of course, use the patterns posted here for their own personal use. AKA: don't steal, people. It's bad karma. This is a Flickr badge showing public photos and videos from gradschoolknitter. Make your own badge here.